Onondaga Lake Conservation Corps volunteers paddled in kayaks and canoes on Thursday, August 6, to identify and remove water chestnut from Onondaga Lake and the Seneca River, helping to support habitat for fish, birds, and other wildlife. The volunteers removed over 2,200 pounds of water chestnut. Removing these invasive plants also improves conditions for local sportsmen. 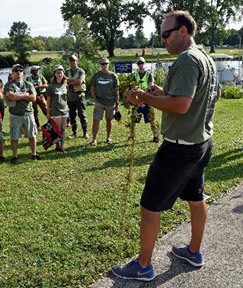 Water chestnut, an invasive aquatic plant species, is impacting Central New York waterways by growing into floating mats of thick vegetation clogging lakes and rivers. The plants can cause fish kills due to low oxygen levels under these dense mats and prohibit boater and angler access. Left: Corps volunteer Phillip Bonn, of Fayetteville, New York, paddles along the shoreline to identify water chestnut. Right: Corps volunteer Nathaniel Stevens, of Liverpool, New York, unloads water chestnut from his canoe. Removing these invasive plants will help Onondaga Lake thrive with native species that are more beneficial to the ecosystem. Left: Corps volunteers Ross and Grace Getman, of Syracuse, remove water chestnut. 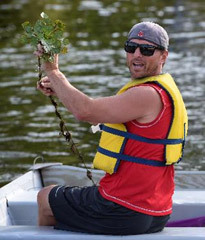 Right: Corps volunteer and Onondaga County Parks Commissioner Bill Lansley removes water chestnut using a rake. On the shores of Onondaga Lake and along the lake’s tributaries, Honeywell is improving 87 acres of wetlands and planting about 1.1 million plants, shrubs, and trees. To date, more than 400,000 shrubs and trees have been planted, and 50 acres of wetlands have been restored. Since the formation of the Corps in summer 2012, 11 events have brought together nearly 600 volunteers who have become environmental stewards and Corps members. In recognition of their work, the U.S. Environmental Protection Agency honored the Corps with a 2015 Environmental Champion Award. 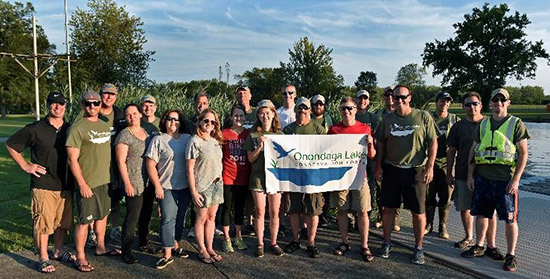 The Corps seeks to inspire future stewards of Onondaga Lake and its watershed through a hands-on, experience-based program that offers citizens and organizations the opportunity to participate in activities that help restore and sustain Onondaga Lake and its value as an Important Bird Area. Founding members of the Corps include Audubon New York, Montezuma Audubon Center, Onondaga Audubon Society, Parsons, O’Brien & Gere, and Honeywell. The newest Corps partner and advisory board member is Anchor QEA.